Five times a year women from all over the world unite to receive a special energy transmission called the Worldwide Womb Blessing, with my mentor and beloved friend Miranda Gray. So for this month’s full moon meditation, I’m holding a virtual Womb Blessing circle to guide you step by step to receive the energies. And providing an extra dose of fertile abundance energy, the August Full Moon is the Grain Moon, coinciding with the August 1 celebration of Lammas, the first Harvest Rite of Thanksgiving in the Great Wheel of the Year. It’s all about celebrating abundance in the form of the first loaf of bread baked (loaf-mass), thanking the Earth Mother, and acknowledging the sacredness of creation between the God and the Goddess. The Womb Blessing is a special energetic transmission connecting you with the Divine Feminine, so there is some ceremony around how to prepare. Our circle will gather at 6:30pm Eastern, 3:30pm Pacific, 11:30pm UK on Monday, August 7. 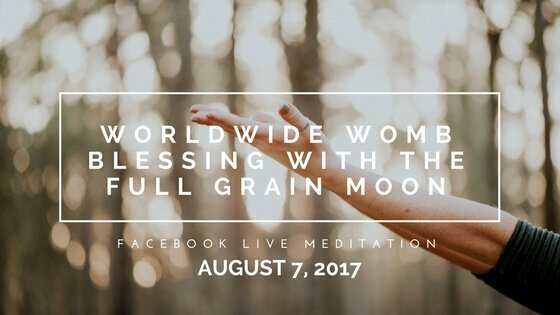 We’ll be connecting with over 150,000 women worldwide so get ready for some super lunar feminine power!! Don’t worry if you can’t make it, a replay will be available. ===>>Add your name to our live cast guest list and then request access to our Facebook group HERE. ===>> Enter your registration details on the official Worldwide Womb Blessing site and choose 24:00 UK time on the registration page HERE. P.S. To learn more about the Worldwide Womb Blessing see: http://www.wombblessing.com.